If you haven’t yet finished buying Christmas gifts for your nieces and nephews and the neighbor across the street, maybe you shouldn’t bother. That’s right, don’t buy them gifts this year — or ever; it’s an economic waste, says University of Minnesota economics professor Joel Waldfogel. On the NewsHour Monday, Paul Solman explores the meaning and limitations of the deadweight theory with the Scroogenomist himself. For more about the economics of gift-giving and its alternatives, here is the edited and condensed transcript of Paul’s extended conversation with Waldfogel. Paul Solman: What is the deadweight loss of Christmas? Joel Waldfogel: Well the deadweight loss of Christmas is just the waste that arises from people making choices for other people. Normally I’ll only buy myself something that costs $50 if it’s worth at least $50 to me. When I go out and spend $50 on you though, cause I don’t know what you like and what you need, I could spend $50 and buy something that would be worth nothing to you. Paul Solman: And why is it called the “deadweight loss”? Joel Waldfogel: Well that’s just a jargon term in economics. It means waste; it’s a loss to one party that’s not offset as a gain to someone else. So for example, if I give you a dollar, that’s a loss to me, but it’s a gain to you so that’s not a deadweight loss. Paul Solman: How serious are you about this idea? Every time I talk to anybody else, including other economists, they say, wait a second, gift exchange, reciprocity, emotional value, that’s what gift-giving is about, not an economic exchange. Joel Waldfogel: Well yes and no. So first of all, I’m at least semi-serious about it and let me explain what I mean. The question is, are we in the U.S. getting $70 billion worth of satisfaction out of the items that we’re choosing for others? My answer is no. Paul Solman: Okay, so propose to me an alternative, a solution to the problem of the deadweight loss of Christmas. Joel Waldfogel: Sure, well so first of all, many givers who are in close contact with their recipients do quite well. Parents actually do pretty well for their kids. Friends do well for each other. Significant others do very well for each other, and so there’s no problem to be solved in that case. The problem arises when people have an obligation to give but know nothing about what the recipient wants. And what’s interesting is people’s own behavior, you know since I wrote this paper 20 years ago, has shown the way toward a solution that they like (and not a solution necessarily that I propose) — that is the enormous growth in gift cards, which are, from the standpoint of economic theory, like giving cash. And what’s so interesting about gift cards as a novel solution is that they seem to avoid the awkwardness of cash. They’re enormously popular with recipients and givers and so they are a market solution, not my solution, but a market solution that account for something like a third of holiday gift-giving. Paul Solman: Yes, the ickiness of cash, why is cash icky? Isn’t that saying something about the nature of gift-giving when it becomes purely or mainly economic? Joel Waldfogel: Cash is icky as a gift, but there’s interesting evidence in the behavior of gift givers. … When big dollars are at stake, people choose cash. … I would interpret that as being precisely because with a lot of money at stake, given that I’m going to do a bad job choosing an item, I’d rather do a better job and accept the ickiness than just do a horrible job and destroy a lot of value. Paul Solman: When I bring a bottle of wine to someone, I always scratch off how much it costs, right? Why do we do that? Joel Waldfogel: Scratching off the price is related to the ickiness of cash, and we don’t like when how much we spent is transparent. But the fact that people find gift cards so popular means that we seemed to have moved past that problem, at least with one category of gifts. Paul Solman: But don’t a lot of gift cards not get used? Joel Waldfogel: We understand that something like 10 percent of gift cards never get redeemed. 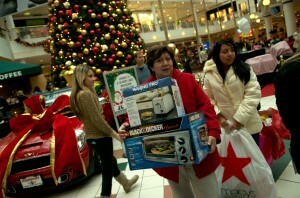 Now that means something like $8 billion a year in the U.S., not all of it around the holidays, but throughout the year. Now in some states, the unredeemed money goes to the state government, in other states it gets recognized as revenue by the retailer. Now that’s not inefficient, but a gift to the shareholders of the retailer is probably not what the gift-giver had in mind. I would love to see gift cards that default to charity after 24 months; that way the buyer could buy it knowing that either his intended recipient or some other worthy cause would get the money. Is Santa Claus Just as Bad as Uncle Sam? Paul Solman: Your analysis of gift giving and Christmas is based on how important you and other economists think the notion of consumer preference is, yes? Joel Waldfogel: Yes, the way we think about how consumers make decisions is that…they have sets of items they would choose to purchase at the prevailing prices if it were up to them. … We think of their decisions reflecting the best they could possibly do. We enshrine that in the whole theory of consumer choice. And of course the theory has limits. It doesn’t work for little kids who change their preferences one minute to the next. … Sometimes you know [about an item] that your recipient doesn’t know and you can actually make a choice that’s better than they would have done for themselves. So it’s not that it’s impossible, but normally, the way we think about choice and consumer behavior is that people do best when left to themselves. Paul Solman: In a sense, doesn’t that underlie the whole concept of market economics that because people have preferences and express them by what they’re willing to pay, we get as a society the optimal allocations of the resources at our disposal? Joel Waldfogel: The idea underlying “Scroogenomics” and “The Dead Weight Loss of Christmas” is just the most fundamental idea of economics that individuals are best suited to make their own decisions, and when others make their decisions for them, not always, but in general, those decisions are not well matched with the preferences of the ultimate consumers. In fact, one of the major criticisms that many people have of government is that when we do things through government, someone else is making choices for us. Sometimes that someone else might be a grandmother or aunt or uncle or Santa Claus. And Santa Claus can be as bad or worse than Uncle Sam. Paul Solman: Is this a kind of an anti-government position? Joel Waldfogel: I wouldn’t think of this as being so much of an anti-government idea; it’s more of an idea that we should have some humility about some of the foibles of our own private market activity as well. But Isn’t Buying Gifts Good for the Economy? Paul Solman: By some estimates, consumer spending is 70 percent of our economy. If everyone follows your suggestion, isn’t that going to put a damper on spending in an economy with 7 percent plus unemployment and a weak recovery, at a particularly touchy time of the year? Joel Waldfogel: I’m not against spending; I’m just against spending that doesn’t produce the requisite amount of satisfaction. Now that I’m old enough to be an uncle myself, I can see why this happens. It’s not that aunts and uncles or grandparents are bad gift-givers; it’s just that they’re not in close contact. So in my ideal world, people would go ahead and spend, but they’d buy things that would actually buy some satisfaction for their recipients as well as accomplishing whatever other goals gift giving might be meant to accomplish. Paul Solman: But what I don’t understand is how would they know [when their spending is worth it]? Joel Waldfogel: Well, first of all, we know when we’re at the store with no idea what to do — those are situations that risk destroying value; those are the situations where one needs to find an alternative. There are many ways to spend money without destroying value: we could give gift cards, we could give gifts to charity in the name of the recipient. Those would preserve spending, but more importantly, from my standpoint, they would ensure that the spending produces some important kind of satisfaction for some ultimate recipient. Paul Solman: The cliché in gift-giving is it’s the thought that counts. It’s not the amount. It’s, did I think about you, have I gone that extra mile to try to understand what you want and show you that that’s what I’m doing? Joel Waldfogel: I think the thought is very important. The thought doesn’t need to be communicated with a lot of money. … When I think about favorite gifts I’ve received from people who are kind of at arms-length knowledge about what I actually need, well maybe my favorite is a photograph of my nephew sitting on my lap. It maybe costs what, a dollar, two dollars to give me this in a modest frame? Favorite gift ever, no value destroyed. Paul Solman: So do you have anybody you need to be buying something for? Joel Waldfogel: Uh yeah, I do. My wife. … Does this run before the gift exchange? Paul Solman: We’ll get it surreptitiously. Let’s go. So what is it? Paul Solman: But wait a second, that is then part of the mystery of gift-giving — you don’t want her to know. Aren’t you reducing with your argument the whole point of gift-giving? Joel Waldfogel: Well, actually, this is something for which she specifically asked, so she does know, but if she doesn’t hear about it immediately before getting it, it’ll be easier for us to all pretend it’s a surprise. Paul Solman: But then there’s lots of pretense, so why should we reduce this to economics? Joel Waldfogel: The reasons why we give gifts have very little to do with economics and a lot to do with our sister social sciences, but it’s the consequences of gift-giving that economics is good at analyzing. Paul Solman: For people outside your wife and your kids, are you known as the guy they can depend on to give them cash? Joel Waldfogel: I rarely give cash. Over the years, though, I have given a lot of gift cards and cards that have little economic diagrams in them. Joel Waldfogel: Yeah, it’s illustrating the benefit of my approach. Mostly these are gifts to economists, so they get the bad joke. Left: Buying Christmas gifts is an economic waste if you don't know exactly what the recipient wants. Photo courtesy of Rod Lamkey/Getty Images.